This may sound obvious but I think that we need this to be loud and clear. There are still too many people who say that they feel that they are not believed when they describe their experience. I started my career in healthcare in ’93 training to be a registered general nurse. My fascination with pain began in the theatre recovery rooms when I noticed how propel responded so differently. The ‘size’ of the operation did not seem to matter. How the person was, in other words their state, really did. Studying pain, I inevitably came across the quote from McCaffery (1968) on pain: “whatever the experiencing person says it is, existing whenever the experiencing person says it does“. This has ever-stuck with me. Everyone behaves in such a way as to meet their needs. When a person describes their pain experience, these are not merely words. It is an expression of need. In chronic pain, we must ask why is pain a predominant feature of this person’s life? What are the needs that must be met for the suffering to ease? To understand this, the person must be free to express their lived experience from the first person perspective. As clinicians and therapists, we can only gain insight through deep listening within a supportive, encouraging and compassionate environment. Deep listening involves being present and paying full attention to the person. Not only do we hear their words but we see how they are embodied and delivered. Getting to know our own biases and beliefs allows us to let these go so that there is no ‘filter’, just pure awareness. This begins the therapeutic process. 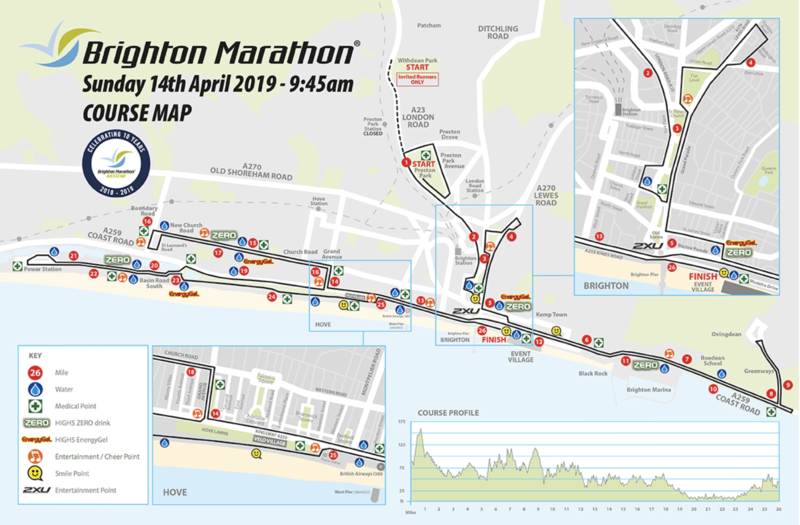 Less than a week to go until the Brighton Marathon 2019 for CRPS UK and UP. It is going quickly! This week is just easy movement: simple, short, easy runs, lots of ‘motion is lotion’ (a phrase I use with people day in, day out), fuelling and other relaxing things. Each day until the marathon on Sunday, I will share a Pain Point. After all, UP is all about raising the awareness of the massive problem of pain and delivering the right messages based on what we really know about pain to society. The way we deal with pain, especially chronic pain, must be revised in line with new knowledge. At the moment, the bulk of the understanding remains in theory — in academic and research circles. We need this to be ‘out there’, with the people. ‘The people’ includes everyone. Those millions and millions of sufferers and those providing care. The basic problem is the misunderstanding of pain, which results in the wrong messages and treatments and the poor outcomes that we see. The numbers are not improving in our society that we can argue is a suffering society, with chronic pain being a major symptom. More on this later. So, what can you do? Share these blogs and messages within your circle of friends and colleagues and let’s drive this forwards. We can reduce suffering in society but we must do it together, ‘bottom up’. People demanding that they are give the right information about pain and what they CAN do to move forward with their lives. Thanks for your support and helping to build a better society by easing pain and suffering! So this morning, after work, I got home and decided to go for a run. I felt good and knew I was going to aim for 5km and depending on how I felt when I got to the end of the 5km I might try to go further. Unfortunately I did not come back with the same positivity that I left with. The first five minutes of the run was good however after that every time I stepped down on my left foot, it felt like someone was stabbing a sharp knife through my kneecap. I managed to run the 5km however came back crying. When I got back, both my mum and dad were around but I did not want to show to them that I had struggled so I just said I needed a minute and went up to my room. I had to strip off as my brace was too tight round my leg and then my running trousers were making my knee more sensitive. I managed to calm myself down enough to stop crying but just felt defeated, which then led on to me feeling like I had bitten off more than I could chew with signing up for the half marathon! About 5 minutes later, my mum came up to check on me. I wiped the tears away but she could tell something was wrong! I could not help but break down, telling her my worries about not being able to complete the half marathon and letting all the people who have sponsored me down. For some reason the thought of my future life was also upsetting me. Ever since I’ve had my CRPS I have always had goals to get to the end of. At 15 it was my GCSE’s. At 17 it was my A Level’s. At 20 it was finishing University. With all of these focuses, thinking about my long-term life never really happened but now at 22, in full time work, there is no end goal. This means its more about thinking of moving out, meeting someone, having children things like that and also knowing that I might be suffering with CRPS for the rest of my life. I know that life could be as good as any life I was going to have before CRPS but the thought of living with pain everyday for the rest of my life is still absolutely frightening and upsetting. My mum has never really liked to talk about this aspect of the CRPS because no one wants to think of their child being in pain for all their life but today she listened then did what my mum is so amazing at. Distracting me, and pulling the real me back out! We chatted like mother and daughter do and started giggling and the pain finally subsided. Today was a bad run, but I am sure even Mo Farah has bad days!! This week really has not been good so far! After Sunday, I took it easy yesterday hoping not to make it worse. I hardly did anything all day but still had stabbing pain through my kneecap still. I went to bed at my normal time however could not get comfortable and so could not sleep. After an hour of laying in bed I gave in and took some painkillers. However even these didn’t work and so 30 minutes after I’d taken the ibuprofen, my knee flared up. It was a short one but where I was drained from all the pain during the day already, the flare up made me feel extremely lightheaded. Within 2 minutes of the flare up settling down, I had layed down and basically passed out. One wake up in the middle of the night and then I was up for work as normal this morning! I wore my big metal brace all day to support my leg while I walked, which meant I could get through work and then also drive to my physio appointment. I do not like wearing the brace as it draws attention to my issue, which I cannot stand but what I cannot stand more is feeling sick because of having to take so many painkillers. Wearing the brace means I do not have to take pain killer throughout the day so it is the lesser of two evils! Luckily I do not loose my freedom anymore when it flares up as last year I got an automatic car, which means I can drive without using my left leg, and so means I do not suffer pain when driving anymore! At physio I spoke to him about everything I had spoken to mum about on Sunday and he reminded me that each day is different and so I will never know what the future will hold so what is the point in worrying about it! With regards to the running he reminded me that a week ago I ran 7 miles. No one forced me, my determination did it so my determination will be what gets me round the half marathon! He told me that this last month before the run, needs to be more relaxed and I need to focus on getting myself to the start line, rather than the finish line! This gave me a boost and the confidence I needed to carry on running, just once my leg is 100% better! So at the beginning of the week, dad told me he was not going to set up his own fundraising page, and instead he was going to ask all his friends to donate to my page and then he would match whatever I make! This morning he emailed the link to my fundraising page out to his friends and my goodness have I been overwhelmed by emails telling me how much people have sponsored me! The amounts keep getting bigger and bigger and my target of £500 had been doubled within a few hours and the sponsorships just keep on coming! Means I definitely cannot back out now because thinking of what that money can do within both CRPS UK and UP makes me jump for joy! Although think Dad is starting to regret saying he would match whatever I make!! So from a week after my last run tonight I finally felt strong enough to put my trainers on again and try to go out running! I had a vague aim of where I wanted to get to for my run but knowing how bad the last week had been I knew that setting a proper aim might make it worse so I just needed to go out and do my best. As I was getting ready my four-legged running partner, Cooper was staring at me, begging me to take him with me. Knowing the companionship, even from a dog, might make the run easier, I took him with me! We both got into our rhythms and just kept on running. Cooper is really good because he quite happily just trots alongside me and does not get too distracted, which means I do not have to worry about keeping him on too tight a lead, which would affect my arms while running. What always amazes me about him is that if for some reason my normally breathing pattern while running gets disrupted he immediately looks up at me to check on me! He is a really good running partner as he can run exactly the same as me but also check on me! We kept running and running and when we got back home, I had the biggest smile on my face as we managed to run 4 miles in 45 minutes! There was a little bit of pain but that seemed to be coming from the ill-fitting brace rather than my actual knee. With this in mind I have ordered a new support, which is more open so is not too tight and will not make my leg quite as hot while running! I cannot wait to get back out at the end of the week! I was expecting some backlash pain after my run on Monday but I felt nothing. In fact I felt better than ever! My new brace also arrived and I was desperate to try it out however today was gym day, so the running would have to wait! With it being so close to the run, my personal trainer thought it would be best to just work on stretching out my legs properly and working on general fitness. With having to have a week off, I thought I would be puffed out within 5 seconds of lifting a weight however surprisingly I was fitter than ever! I skipped the most I’d ever done, I lifted the largest weight I’d ever done and I did the best pull ups I’d ever done! I thought the week off would slow me down, however it seems it’s just made me stronger. I feel more ready than ever for my run, which is now on only 17 days away!!! I was desperate to try out my new brace and I felt I needed to try out running a long distance again. I decided I was going to try running a 10km although Dad is away so was worried I might struggle a bit without any company to keep me going. I had a plan of where I was going to go in my head however did not completely set the route as I never do, to reduce the risk of any pain. When I set out I just thought I would try my best, whether it would be small or long. Every run I have previously done from home starts the same way, by going up a steep hill onto the main road I run along. Previously I have never been able to run all the way up this hill, normally get half way up before I start puffing however today I ran and ran and ran and then was at the top. Before I had even started the proper run I had the biggest smile on my face because I had managed to get up the hill! It gave me such a boost and so the main run began. I changed the route in my head as soon as I started, as I wanted to make sure I was as comfortable as possible. My first part of my run was only about 1km so I went slow and steady and used it as my warm up. My new brace was incredible and so I had hardly any pain, which meant I got into my rhythm really quickly and still had the biggest smile on my face! It was getting warm but my breathing was under control so I was still feeling comfortable! I got to the point, which I originally decided would be turning around point as I was going to do, two laps but I was then worried if I turned around the pain would start so I carried on. I ran down a road that was very up and down but I was still running by the time I got home. I was so happy with myself however still wasn’t sure how long I had managed to do! I got my phone out to check and I had run 10km and felt like I could have kept going! It was hard but it was also such a boost!! I finished my run today, really excited for the actual thing! It’s been a quiet beginning of the week as I did not want to do too much with the race day getting closer and closer. However today is the turn of my last proper gym session before the real thing! The main focus was overall body strength and all was going well until the second round of dumbbell presses on my right side. As I pulled the weight up, the left hand side of my back too a big stab. I dropped the weight and sat down. I hate when my condition becomes obviously within a public place as it makes me so nervous, which then makes the pain worse. However my personal trainer was very good, letting me sort myself out before getting me to carry on but move onto something else, which would not be as irritating. We did lots of different backstretches, which dispersed the pain so I still walked out normally. I was so happy about this as I had also planned to go for another long run with Dad tomorrow and I really did not want to miss that, as I knew how important it was! I may not have worked out as hard as I wanted but I feel today was more of a success with the fact that even with some stabbing pain, I could carry on! Work went way too quickly this morning. My nerves about going out for my first ever 16km run was at its maximum. I went to meet Dad at the office and was so nervous I could not even speak to him; I just wanted to get going to see what I could do. We set off both feeling good, except for a massive stitch that I had in the left side of my abdomen. The first 5km seemed to go so quickly. I think this was because for the first time I actually spoke to Dad while running. I’ve never done it before because I was always worried about disturbing my breathing. I’ve worked on my breathing rhythm so much that now it just comes naturally and I do not focus on it. This made me feel better about talking to Dad, and when I did start talking to him, it brought me straight away from any aches I had. We ran pretty much all of the first 12km however as we started our last 4km loop, Dad began to suffer with some pain within his legs. This meant we did a mixture of walking and running but that was fine as my pain was starting to get worse so it also gave me a bit of a break! I am so determined to run this half marathon that even when I have been in agony on training, I do not stop and I do not say anything because I feel I can just keep going, even if that makes the pain worse. So actually Dad needing to stop was a bit of a benefit as it made me take a break and let my body settle a bit. We made it to the last 1km and now Dad had to keep me going as my hip felt like it had completely dislocated. I was running, if you could call it that considering I was limping, all the way to the end! Even when Dad pulled up with cramp I continued to the end. I got into the office and thought I was dying, but then I looked over at Dad and he looked exactly the same as me so I felt a little better! Now I know I can run 16km, I feel a lot more confident about next week as now it is only the last 4km that will be new! I cannot believe in 8 days I will be running the real thing! It has come so quick but I am so excited for it now! So unfortunately the happiness and excitement of Saturday’s run was not long lived. After going to the cinema Saturday night, I suffered a flare up, which was a bit of a knock back. It has always been normal for me to be left in pain after the cinema so adding the pressure of the run on top of that, meant I was not surprised when it happened. People always think I am strange when I just accept the flare ups, but if I do not accept them, I cannot move on and get on with my life each day. That does not mean they do not still frustrate me and upset me every single time but I left myself feel those feelings then I carry on. I carried on, on Sunday, doing my horse in the morning then going to work and although it was hard, my will power keeps me going. The afternoon was not so easy, the pain got worse so I knew it was time to ask for help. I asked someone to look after my horse and luckily I did as I then suffered a second flare up. Having double flare ups in the space of 24 hours does not tend to happen to me anymore so I try not to dwell on them but it is hard as you feel like you are being knocked down twice!! However once the second flare up was out the way the aching lifted a little, just enough that I could smile again. I thought the last few days would make me more nervous for the run however all its done is make me be more realistic. I have just accepted that I will probably be in a lot of pain after my run if not suffer a flare up, but that’s okay because it would have been for a good reason and maybe just this once, the pain would be worth it. I agreed to go and see the personal trainer to discuss my nutrition for the last few days before the run and also to stretch myself out properly before the run. I never knew stretches could be so painful!! Everything ached and twinged as the personal trainer helped stretch me out. However afterwards I felt so good and loose. Felt like I could go run a marathon, which is luckily because I’m running half in 4 days!! We spoke about the best things to eat on the day and to eat before hand and I was so glad he said I didn’t have to eat beetroot as every runner had told me that I needed to have a shot of concentrated beetroot on the start line, but I hate beetroot!! He said it might be an idea to have some jelly babies in my pocket during the run to give me an energy boost when I need it, however I then remembered that on my Duke of Edinburgh I ate jelly cubes and so that was it, I was taking jelly cubes to the run with me! I cannot believe how quickly the run has come around. I am both excited for not only getting myself this far but also for the possibility of the actual day and also nervous about letting people down. People have been so generous donating to me and I really will put my best effort into running it on Sunday! Let’s hope I make it to the start line! RS: I am sure you will! All the hard work has been done now — a very positive approach taken, inspiring many. Well it’s been a very busy start to this weekend, what with having to cover a shift at my old restaurant job Friday night and working today. I thought I would be shattered but I was surprisingly energised! Enough to ask my dad if he was around to go for a run this morning when I got home from work! For once he was actually around and free so we could go. However, we had an extra runner with us today in the form of our four-legged family member, Cooper. This meant that for the first time I went running in a national park rather than on roads. I wasn’t sure how it was going to go because of the difference in terrain but Dad and I agreed that we would run one loop and see how we felt before deciding whether to run a second loop! Dad and I hadn’t been out together for a while and we were not sure how Cooper was going to be but it was a really nice easy run, apart from the few times Cooper decided to run right under my feet! The terrain was hilly and the ground was mostly sand which did make the run slightly harder than I have previously don however once I was in my breathing rhythm the run was almost natural! We did the first big loop followed by another smaller loop and although the lactic acid was starting to kick in. I felt like I could carry on however it was starting to get warm and Cooper was getting tired so we called it a day. We ran 2.5 miles which I was extremely happy with! And we agreed that we would both take our running gear on holiday with us next week so we could do some more training together, although it will have to be early in the morning as do not think I could run in the Italian sun! Today I’m not writing about my marathon journey but about my normal 22-year-old life. Everyone will have to make some sacrifices in their lives; whether it is big or small and I am no different. When I was 15 I didn’t think making sacrifices would be that difficult but now at the age of 22 they do become more of a challenge. The challenge doesn’t actually come from the sacrifice, I’m pretty good at sticking to them, the challenge comes from the judgements of others! So at the age of 22, clubbing with friends has become a part of my life and I love to dance! The issue comes with the second part of a normal night out…….alcohol! Now I do not actually like the taste of alcohol that much but in the right mood I can enjoy a vodka cranberry or two however when you are on daily epileptic medication that’s changes. Anyone on a similar medication will know that it really does not mix (trust me I tried on my 18th Birthday!) which means when I go out clubbing with my friends, I am designated driver. Neither me or my friends are bothered by this as we all know I can still enjoy myself without the alcohol but I am still surprised by how offended others get! Constantly being asked “Why! ?” or “How can you be here without drinking?” or “Come on surely you can have one?” begins to get boring and repetitive. I do not like telling people that I’m on medication as soon as I meet them, because frankly why do they need to know but in my experience people will push and push until I mention the medication. As soon as that is mentioned, people back off but I do not see why I could not just go out without drinking anyway! As long as I enjoy myself what does it matter!! At 15 sacrificing the ability to wear high heels was not a big deal to me but now obviously I want to wear the nice heels that match my new dress when I go out clubbing! Wearing heels hurts but I can manage it but wearing heels and showing off my best dance moves is a little harder! Luckily if I go clubbing, I go out with very close friends who know exactly what my situation is. Whenever I go out I always carry my emergency pills and my medical ID in case and my friends are always aware of this but that is not what makes me feel safe and secure when I am out. What does, is the fact that my friends are able to tell when I am struggling and so will make me take a seat, take my pills or suggest going if it was bad enough! Knowing I have that support even in that environment makes me enjoy it even more! Tonight I went out clubbing with my best friend and we had an amazing time! However tonight was one of the nights I had to take the option of leaving when it got painful and as soon as we were out of the club, the heels came off! But it was and always will be worth it! A nice break in the sun is what most people look forward to in the summer but for myself and other CRPS sufferers, spending time in the sun comes with its own issues. A main complication of CRPS is hypersensitivity, which means extreme changes in temperature and exposure to direct sunlight can cause increases in pain or worse a complete flare up. This has happened to me many times in previous years however being 6 years into my disorder means I have found ways to avoid this happening or dealing with whatever does happen. Unfortunately this wasn’t the case for me last night. I am currently on holiday with my family in our lovely new house in he Italian hills! It is so lovely and the weather is amazing but this just meant I sat outside in the sun all day long yesterday! This meant that while at dinner with my family last night I suffered a flare up in my knee and hip. Luckily we had stayed in for dinner last night so when the pain started I was able to take myself up to my own room and deal with it on my own, like I would at home. After 20 minutes I re-joined the family for ice cream and laughs just slightly frustrated and crippled! Today I woke up knowing it was going to be a rough day, which automatically put me in a bad mood. I try not to allow myself to stay in bad moods for very long anymore as they do not help the pain but sometimes you can’t help just feeling frustrated and angry! Because my knee was still extremely painful I chose to spend the day inside out of the sun and heat, to try and calm it down. This is what frustrated me because I am on holiday, so all I should be doing is spending the day out in the sun, with a good book and dipping my feet in the pool. As frustrating as it was to be stuck inside all day, the plan was that I did that for the day so that tomorrow I can go back out and enjoy the sun! So fingers crossed!! So the day inside on Wednesday worked!! Yesterday I was back out in the sun, swimming in the pool, and good as new! After having an extra day just to double check my knee was better, Dad and I agreed to get up early this morning to go for a run down along the sea front. We agreed to leave at 6am so we were on the sea front by 6:30am when it was still fairly mild. I overslept slightly we didn’t actually get down to the sea front till about 7am and it was already 21 degrees!! I was hot before I even started running. The running was surprisingly easy however the heat caused some issues both in respect to the increased difficulty in breathing and also the fact my knee got very hot under my brace and so began to hurt! We did 2.7 miles, which doesn’t seem a lot but considering the temperature, we were both shocked! I find the running a lot easier when I am with Dad as it keeps me going when if I was on my own I might give up! I am hoping this will help me on the race day! The last 10 days since being back have been so busy, which is why I haven’t had chance to sit down and right down a blog in that time. It is also because I haven’t had chance to do anything in the last 10 days because I have been so busy with work and other things. Today was the first evening I had free to be able to go out for a run since the run in Italy. It had been a warm day and the temperature only let up a little bit when I went out. I had a vague idea of where I was wanting to go however I didn’t make the decision on where my turning round point would be. I just wanted to run and enjoy it. I did 2.7 miles again which although isn’t much again, really was the best I felt I could do and for me that’s all I can do is my very best! When I got back Dad was doing some skipping training and considering I have not skipped since before my injury, I thought it might be fun to try it and see how I got on! I was surprised at how good I was at it considering I have a bad knee and also had just done a run. There is a competition at my gym for the first person to do 200 skips in a minute will win a prize, so that’s my next aim! So, this morning, I had a personal training session at the gym. My calves where so tight after my run Tuesday night and because I then walked round London shopping yesterday! Unfortunately, I am too honest and so told my personal trainer this, who then decided to stretch my legs out for me. I almost cried! Because I had done my run, we decided to focus on weights and core work rather than my cardio. Being a rider, my core should be good however I haven’t ridden properly for about 6 months so was not very hopeful that it would be as good as I wanted it to be! However, I was pleasantly surprised! There is a challenge at the gym to see how long you can swing from two rings, that are hung from the ceiling, with your knees bent at a 90-degree angle. I gave it a go thinking I would last about 2 seconds however 20 seconds later, I was still holding on! My best time today was 25 seconds, which put me as leader for the ladies! Not sure how long I will stay leader though so need to do some more sit ups I think! Well today wasn’t a great way to end the weekend. After my positive week with my run Tuesday, seeing the psychologist on Wednesday, going to the gym on Thursday and then having another amazing night out on Friday, I was very happy and content with my week. However, this morning I woke up with my ankle tingling and my knee feeling like it had an ever-expanding amount of pressure inside it, I knew today might not be all that great! Nevertheless, I got up as normal at 5:45am, went down to my horse then went to work. While at work I began to suffer some stabbing pain within my knee and severe pain at the bottom of my ankle. I kept having to have breaks, so the work took me longer than usual. I started work normally, but left work limping and unable to put weight through my ankle. This may seem strange to many people but this is a normal flare up for me. I will tend to be able to feel one coming now a day’s due to having had the disorder for many years but I can never tell exactly when it will happen. Therefore, I carry on doing what I am doing at that time because if I stop it might not happen for another few hours, in which time I haven’t done anything I had planned to do, which is frustrating. I will also tend to be walking normally up until the point the stabbing pain starts because I do not like making it obvious that I am in pain to others. I know how to best deal with the pain so having others surrounding me, asking me “Are you alright?” or “Can I get you anything?” doesn’t help as it just draws more attention to it which makes the pain worse because I am more stressed out. I understand it is people’s human nature to want to help someone who is clearly in pain but as many of my family and friends know, I just prefer to be ignored. The best example I have of this is when one day about a year ago I suffered a flare up while out food shopping with my mum. I had suffered a flare up a few days before so was limping as the pain was still dying down from the last one. When I am like this I always push the trolley as I use it as a slight aid to help me get around the shop. My back or hip (I cannot remember all of them as I have so many) started to flare up and I was stuck in the middle of M&S, hunched over a trolley, crying my eyes out. Everyone began to stop and stare, wondering what was going on so my mum carried on walking, heading to one of the refrigerated sections. I slowly followed her, still crying but aware that when I started moving again people stopped staring. It was at this point, while I was feeling a giant stab in my back that my mum has walked back across to me, with two packets of sausages in her hands and said, “Which ones do you think we should get Elz?” If I wasn’t crying at the time I could have laughed but what she did worked. The pain stopped in that second so I could stand back up and look at her and tell her which ones we should get! People will probably read this and think, why didn’t my mum instantly drop everything to make sure I was okay but the thing is this is exactly what I tell family and friends to do when I have a flare up. I hate my disorder and the attention it brings so when it does flare up, especially in public I get highly embarrassed, which causes the pain to get worse. What my mum did that day was distract me. She stopped me thinking about the pain and all the people staring at me so that I could calm myself down enough to stop the pain. And once she knew I was out of the major pain then she asked me if I was okay. I guess I am writing about this today because I think it is important for people to understand that every person will experience pain differently to the next person. That also means we all deal with pain in different ways too. Some use pain killers, some soldier on through and some learn to manage it. However, none of these options are a wrong option if they work for the individual person. No one or the people closest to that person should be judged for how they deal with their pain, as everyone is different. Needless to say, I did not take any pain killers that day and both my family and I carried on as normal and by the end of the day my pain had halved. So, although today was full of pain, it was a good day, full of pain! Well after yesterday I was extremely surprised to find that I got out of bed normally this morning, and then walked normally. It was a very nice quick recovery! I was just hoping it was going to last considering I had organised before the weekend to go out on a long run with my dad while at work today, and unfortunately, he hadn’t forgotten. He said we were going to run 10km, which I think is the furthest I have ever run in one go in my life, so I was nervous already, let alone adding the fact I had been crippled in pain yesterday! But I was determined not to let him down as he is training to run with me on 8th October. Although, I was so nervous, I did not talk to anyone in the office all morning! I think everyone thought I was sick!! I got about half way before the second amount of pain started. So, not only was my knee feeling like it was being ripped apart but then my hip started to feel like it was going to pop out of the socket (It would never actually do this, this is just one of the pains I suffer due to the CRPS!). I almost stopped so many times but I just kept thinking if I stop now, I won’t start again because I will want to avoid the pain. It’s always at moments like these, when I am starting to doubt myself that my amazing dad comes up beside me asking me if I am okay. It is like he knows what I am thinking and knows I need a distraction to keep me going! I never tell him I am in pain while we are running as I do not want him to make me stop but I always think secretly he knows, but he is kind enough not to say anything. It felt like it went on for hours but then the end was in sight and it took all our strength to keep going but we did it. I thought my leg was jelly when we did make it back but I had manged to run pretty much all of it and I wasn’t sick at the end!! This is when dad checked his phone which had been recording out run and he gave a nervous sort of smile before announcing that we had run further than 10km. We had actually run 11.77km which is 7.1miles! That is half of the total amount that I have got to run! Once I had got some air back to my lungs and cooled my leg down enough that the pain began to subside, I let out a huge smile. If a year ago you told me that today I would run 7 miles I would have laughed in your face and told you to leave me alone. I could never have seen myself ever being able to achieve that but now all I want is more!! So my determination for this half marathon doubled today and there is no way I am stopping now!! The positivity from yesterday has died down a bit! My calves are so tight I do not want to lift my feet off the ground, my knee is aching and I feel like my right foot is completely bruised!! Luckily, I had today off so after doing my horse I went home and relaxed watching movies all day. However, this evening I did have a pre-booked personal training session with my brother as my normal Thursday slot was not available this week! I haven’t really had any pain today, which is very surprising but I was still tired after yesterday! Nevertheless, I headed off to the gym with my brother hoping for a bit of an easier session today. I did not let him know straight away this time that I had been for a run yesterday as I wanted to avoid the stretches! So instead the personal trainer made me start by skipping. This is when I wished I had asked for the stretches because both my calves and knee began to really hurt! But, I carried on and started to feel my calves loosening off although my knee was really beginning to hurt. In the end, I had to tell him about the run (which he was impressed about) and tell him my knee was hurting with the exercises we had been doing so he adapted mine for me so I could still train while not hurting myself more. This is why I like coming to see my personal trainer because he knows that I do suffer some quite bad pain with some of the exercises but that I am also determined to carry on and try to do them, so instead of telling me to stop he just changes them and then pushes me to do my best! It may seem like a really small insignificant thing, but to me it is much more than that! It makes me feel normal at the gym which I have never felt because before coming to see him the only time I had been in a gym was when I was doing my physical physio. It also makes me enjoy the session even though I am in pain! We did a lot of weight exercises and the personal trainer was laughing as I was using one weight less than my brother when doing the bicep curls!! Clearly all the lifting of full wheelbarrows does the trick!! I am looking forward to the CRPS Conference this week for a number of reasons. The primary reason and purpose is to connect with others who want to drive social change in terms of pain. I will be representing UP of course, and encouraging people to join our community as we forge forward with enterprising work to change the way society thinks about and addresses pain. Pain is embedded within society and hence is a social problem. You could also call pain a public health problem, with both terms more accurately defining the nature of the issue. Pain is not a medical problem. Conferences for particular conditions are often dominated by clinicians and scientists. Whilst these groups must be there, so should patient representative organisations, policy makers, MPs and others who must play a role in the much needed change. The best example of this in action was the recent SIP conference in Malta when every group was present to discuss how we can move onward and the next steps. Sadly, I have neither seen nor heard any positive reverberations in the UK from this key meeting. All the work is going on in Europe. I hope the UK will wake up. I will certainly keep nudging until we do together with my friend and co-conspirator, Pete Moore. Coming soon, we have some short videos of recent conversations we had about pain ~ sign up to the UP website and you’ll receive notification. The CRPS conference will be a chance to talk to researchers about their new findings. Naturally I can read their papers, but the chance to chat and connect is vital. We need much more interaction between those in healthcare and those doing the research. The science must be distilled into something that can be consumed by all, which is another of UP’s purposes. I was delighted that we filled all the places and had to add several more for the CRPS workshop on Monday. It was an excellent afternoon with a really engaged group, keen to understand and know what they can do to move onward. That is the premise for Understand Pain and Pain Coach Workshops, where we deepen our knowledge of pain so that we can focus on what we CAN to be successful and get results. This was the first UP & CRPS UK workshop at Royds Withy King in Bath, and based on the demand and feedback, we will be rolling out future dates across the UK. We will also be extending the workshops to a day so that we can have even more experiences of success together. The day is all about taking action and having the experience of what that is like, driving and motivating change in your desired direction. There is no reason why we can’t address pain, learn, transform, and have fun at the same time! What did people most enjoy? Come and join us next time! For release in September ~ In conversation: Rich and Pete talk pain. A series of short videos focusing on the key areas of pain. See Pain Coach and Physiotherapist Richmond Stace + Pain Toolkit’s Pete Moore in relaxed conversation. My aim is to create a community so that we can drive social change via new thinking based on new understanding of pain and the action we must take as a society. This is just the beginning. Join us! The London Marathon is next Sunday, 23rd April. This means a week of relaxing, putting my feet up, being fed grapes and generally letting everybody run around after me. Well, that’s the dream…. It’s an interesting time during the tapering. I feel that I should be doing more. My body behaves like a dog waiting at the door with lead in mouth, yet I know (from some excellent advice) that the opposite is what is needed right now. A few easy, short runs will be just fine, I keep telling myself. It has been hard work but a thoroughly enjoyable test of one’s ability to keep going and maintain a training routine of 40+ miles a week. That’s a lot of time. Some may say ‘me time’. I am grateful for those close around me for allowing me to spend a good chunk of time out there and then putting up with my stretching, moving, twitching and generally fidgeting to ease the aches and pains. I have also probably become a bit ‘boring’ as I talk about the times I have run…. It is hard to avoid thinking about a time. Initially I was just aiming to finish but now I am eyeing four and a half hours. But who knows! I have never done this before so it is a leap into the unknown! I doff my hat to all my fellow runners and wish them all well on their individual quests. By all accounts the London Marathon day is a great one and I am thankful for the chance to experience the crowds, the buzz and the bobbing heads of the sea of runners. Complex Regional Pain Syndrome (CRPS) is a collection of signs and symptoms that define this particular condition. A syndrome according to the Oxford Dictionaries, is a ‘group of symptoms which consistently occur together, or a condition characterized by a set of associated symptoms’. Therefore, we can clump together any set of symptoms and give it a name, which is really what has happened over the years in medicine. The important point is that when we use the term, we should all know what we are talking about and know what we should look for to make a diagnosis. In other words, a set of guidelines. The Budapest Criteria delivers guidelines for CRPS, which you can read about in this paper by Harden et al. (2013). The clinical criteria (see below) acknowledge the sensory, vasomotor, sudomotor/oedema and motor/trophic categories that really highlight the complexity of CRPS. Pain is often the primary concern, with people describing their incredible suffering in a range of graphic ways. However, it is not just the pain that causes suffering but the way in which the life of the person changes together with their sense of who they are and their sense of agency seemingly lost. One of the roles of the clinician is certainly to help restore that sense of who I am, a construct that is built from many of life’s ‘components’. A diagnosis made in the same way, based on the same criteria means that clinicians, researchers and patients alike are all discussing the same condition. This may seem pedantic but in fact it is vital for creating a way forward. Clinicians mus know what they are treating, patients must know what they are being treated for and researchers must know what they are researching. Sounds obvious but let’s not take it for granted. So the Budapest Criteria has pointed all those with an interest in the same direction. Consequently we can focus on creating better and better treatments. what do I, the bearer of the pain, need to do to get better? what will you do, the clinician or therapist, to help me get better? New thinking, new science, new models of pain over the past 10 years has advanced our knowledge enormously. Understanding how we change, how our body systems update, how we can make choices as individuals, and the practices we can use to change our pain experience to name but a few, create great hope as we tap into our amazing strengths and resources as human beings. Detailing the treatment approaches is for another series of blogs, but here the key point is that the first step in overcoming pain is to understand it. It is the misunderstanding of pain that causes erroneous thinking and action, which we can and must address across society — pain is a public health issue. Chronic pain is one of the largest global health burdens (Vos et al. 2012). It costs us the most alongside depression, and I believe that this need not be the case if and when we change how we think about pain, based on current and emerging knowledge. This is the reason for UP | understand pain, which we started in 2015 with the aim of changing the way people think and then approach their pain, realising their potential and knowing what they can do. We are about to launch the new website that is packed with practical information for the globe to access online. Alongside this we have plans to create a social enterprise that will purport the same messages, coming from the great thinkers and clinicians who are shaping a new era in changing pain. I am very excited to announce that I will be running the London Marathon this year jointly supporting UP and CRPS UK. CRPS UK is a registered charity that is focused upon supporting people with complex regional pain syndrome (what is CRPS?). CRPS is often a terribly impacting condition characterised by intense pain and accompanying symptoms that reach into every aspect of the person’s life. Having received little attention, CRPS is gradually becoming more recognised, thanks in great part to the on-going work of the team at CRPS UK. Georgie, my co-founder at UP, came to see me several years ago with CRPS and therefore at UP we were thrilled to team up with CRPS UK. CRPS has been a condition that I have studied for many years, and having worked with many people living the condition, personally I am honoured to represent CRPS UK and UP in this way, hoping to make a contribution by raising money to allow the work to go on. Chronic pain is the number one global health burden. Think about all the conditions that hurt and cause pain. This is not just musculoskeletal pain, but all pain — cancer, gastrointestinal disorders, headaches, migraines, pelvic pain, heart disease, post-surgical pain, infections, inflammatory disorders! If pain was understood globally, by society, by individuals, we would know what we can focus upon to overcome the problems and live as best we can in a meaningful way. At the moment this is not the case. There is still a focus on the tissues and pathology as an explanation, but this is not the case. We have known for years that pain and injury are poorly related, and that there is much more to pain to know and work with to create the conditions for change. This is what we aim to do at UP and CRPS UK. Pain is a public health problem affecting millions in many different ways: home life, relationships, social activities, work to name a few. People need to know the ways in which they can navigate these issues and move onward. The money you give will directly support projects and initiatives to reach this end where we hope to influence the policy makers and healthcare providers, but in essence to help the individual ease his or her suffering.